SUPPORT SYSTEM: If timing is everything, then this Sunday’s show at the Santa Barbara Bowl really does have it all. Taken outside the context of Father’s Day, oldies Steve Miller Band and jam folkies Dispatch don’t seem to have much in common — let alone belong on the same bill. But if you’re thinkin’ in terms of pops, well, that’s another story. In fact, I would go so far as to argue that the offspring of Steve Miller fanboys would — and probably do — love the grassroots, no-shoes, no-shirt vibe that Dispatch has been championing for the past 17 years (give or take a hiatus or five). I mean, what kid who grew up listening to “The Joker” wouldn’t go ga-ga over “The General”? Am I right? So, you ask, what happens when these two acts get together under the stars on National Dad Celebration Day? I’m guessing a lot of beer drinking, slow grooving, and sing-along-style father-son bonding. The Steve Miller Band and Dispatch play the Santa Barbara Bowl on Sunday, June 16, at 6:30 p.m. Call (805) 962-7411 or visit sbbowl.com for tickets and info. HOT HOT HEAT: Let’s face it: Summer means it’s officially time to dance. Chalk it up to warm weather, daylong parties, or the universal lack of inhibition that seems to come with the season, but there’s just something about this time of year that begs people to groove. So, if you’re in search of a night to get down this week, look no further than Saturday night at Muddy Waters Café, where New Noise Santa Barbara will present L.A.’s Very Be Careful live in concert. Since forming in the late ’90s, the band has developed a strong and fervent following in Southern California and beyond. 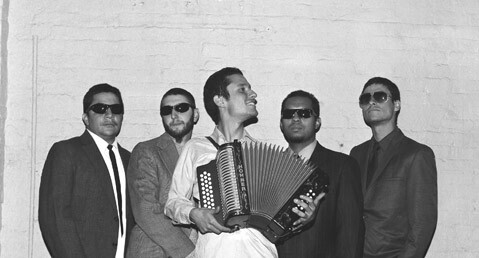 The reason: They err on the side of tradition, mixing Vallenato and cumbia rhythms and structures with a modern twist that’s part hip-hop, part gypsy jazz, and part punk. What you get falls somewhere between Antonio Rios, Gogol Bordello, and the Buena Vista Social Club, meaning it’s the perfect soundtrack for letting loose, be it at a club, during a backyard BBQ, or on the reverberating tile floor of Muddy Waters. The all-ages show takes place Saturday, June 15, at 8 p.m. Call (805) 966-9328 or visit newnoisesb.org for tickets and details. MILLER TIME: Also this week, Old 97s frontman Rhett Miller heads to Muddy Waters Café (508 E. Haley St.) for a solo show in support of his latest, The Dreamer. Miller is an alt-country crooner by trade, and his acoustic shtick doesn’t fall too far from the 97s’ tree; The Dreamer is filled with airy guitars, sprawling lap-steel details, and Miller’s sweet, soft-spoken vocals. What sets the album, and this new incarnation of Miller, apart, though, is all in the lyrics. Here, Miller’s other life as father and husband doubles as major source material, no doubt inspiring songs like the happy-go-lucky “Picture This” and the Randy Newman–channeling “Sweet Dreams.” But that’s not to say that the somber side of Miller doesn’t show up to make an appearance; “Complicated Man” is a slow, waltzing, and whisper-thin number that just happens to be The Dreamer’s hands-down highlight. Catch Miller at Muddy on Sunday, June 16, at 8 p.m. Call (805) 966-9328 or visit facebook.com/muddywaterscafe for info. TO THE WEB: Head on over to independent.com this week for all sorts of online-only goodies, including a Q&A with indie-pop act Camera Obscura (they play SOhO Restaurant & Music Club on Sunday, June 16) and a review of last weekend’s Pat Benatar and Cheap Trick show at the Santa Barbara Bowl.